Blueberries are among the most important foods for good health. The diverse and wondrous health benefits of blueberries are primarily due to their high content of specialized pigments known as anthocyanins. 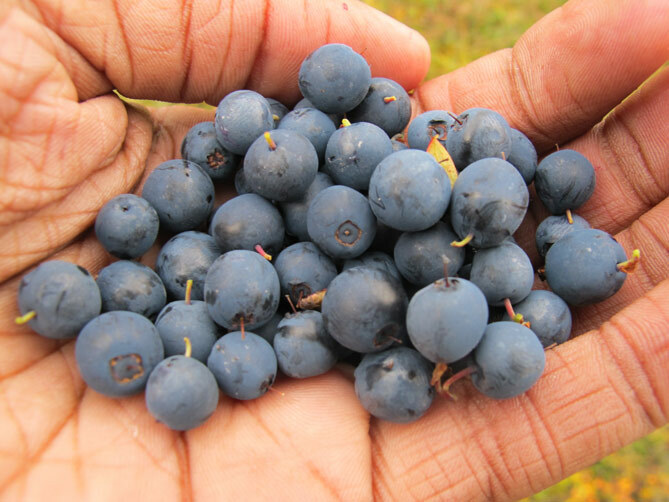 These special flavonoids are responsible for the deep blue or purple color of blueberries. Besides lending color to fruits and flowers, flavonoids are responsible for many of the health benefits of foods, juices, and herbs. More than 8,000 flavonoid compounds have been characterized and classified according to their chemical structure. Flavonoids are sometimes called “nature’s biological response modifiers” because of their anti-inflammatory, antiallergic, antiviral, and anticancer properties. It is a well-established fact that a higher intake of flavonoids offers significant health benefits. Now, a new study has shown that regular blueberry consumption can produce clinical effects in reducing high blood pressure. The consumption of flavonoid sources such as berries, apples, green tea, dark chocolate, and red wine have all been shown in population studies to be associated with a significantly reduced risk for heart attacks and strokes. For example, data from the Nurses’ Health Study (NHS) II of 93,600 women showed that a combined intake of >3 servings a week of blueberries and strawberries was associated with a 34% decreased risk of having a heart attack compared to those consuming the berries once a month or less. The major benefits of flavonoid consumption in protecting against cardiovascular disease (CVD) is largely due to their effects on improving the function of the cells that line the blood vessels (endothelial cells). The endothelial cells play a pivotal role in the regulation of vascular tone and structure as well as vascular inflammation and clot formation. The lesions of atherosclerosis (hardening of the arteries) first begin to develop with damage to endothelial cells. Flavonoids, particularly the types found in berries, have been shown to protect and improve endothelial cell function. In addition to blood pressure measurements, arterial stiffness and blood measurements of C-reactive protein, nitric oxide, and superoxide dismutase were measured at baseline, 4 weeks, and 8 weeks. After 8 weeks, systolic blood pressure and diastolic blood pressure (131 mm Hg and 75 mm Hg, respectively) were significantly lower than baseline levels (138 mm Hg, 80 mm Hg), whereas there were no changes in the group receiving the control powder. Blueberry consumption was also associated with improved arterial stiffness. The biggest change, however, was in nitric oxide levels. Results showed that the nitric oxide level was greater (15.35μmol/L) in the blueberry powder group at 8 weeks compared with baseline values (9.11μmol/L), whereas there were no changes in the control group. Nitric oxide plays a central role in determining the tone of blood vessels. Specifically, it exerts a relaxing effect on blood vessels thereby improving blood flow. It also improves blood fluidity and reduces blood clot formation. These results show quite clearly that daily blueberry consumption may reduce blood pressure and arterial stiffness, which may be due, in part, to increased nitric oxide production. This study shows quite clearly the importance of dietary flavonoids in improving cardiovascular health. But, different flavonoids and other plant pigments provide different health benefits. One of my key dietary recommendations is for people to consume a “rainbow” diet; they need to focus on colorful fruits and vegetables. Regularly consuming colorful fruit and vegetables—red, orange, yellow, green, blue, and purple— provides the body the full spectrum of pigments with powerful antioxidant effects as well as the nutrients it needs for optimal function and protection against disease. In addition to eating a rainbow diet, I also recommend taking some sort of flavonoid-rich extract such as blueberry, green tea, Ginkgo biloba, cherry, pine bark, or grape seed on a daily basis. And, of course, 1-2 ounce serving of dark chocolate per day or some other source of cocoa flavanols is also something else I endorse. Johnson SA, Figueroa A, Navaei N, et al. Daily Blueberry Consumption Improves Blood Pressure and Arterial Stiffness in Postmenopausal Women with Pre- and Stage 1-Hypertension: A Randomized, Double-Blind, Placebo-Controlled Clinical Trial. J Acad Nutr Diet. 2015 Jan 2. pii: S2212-2672(14)01633-5.